Media: Soft cover, landscape format, 50 pages plus covers (incl. full colour centre pages). Advantages: Great timing as Airfix has re-released their Cambelltown in 1/600, and Mirage are set to release one soon in 1/400; excellent companion for modellers. Recommendation: Highly Recommended to ship modellers. The US four-stackers might not have been the prettiest Destroyers ever built, but there was no doubt the British were very pleased to see them in the Second World War, as they needed every ship they could lay their hands on in their efforts to defeat the U-Boats. Most of these Flush Deck Destroyers were built during the First World War. At that time they were sleek and fast - some reaching top speeds of 40 knots (74 kph), but by the start of the Second World War, most had seen better days and some had already been scrapped. 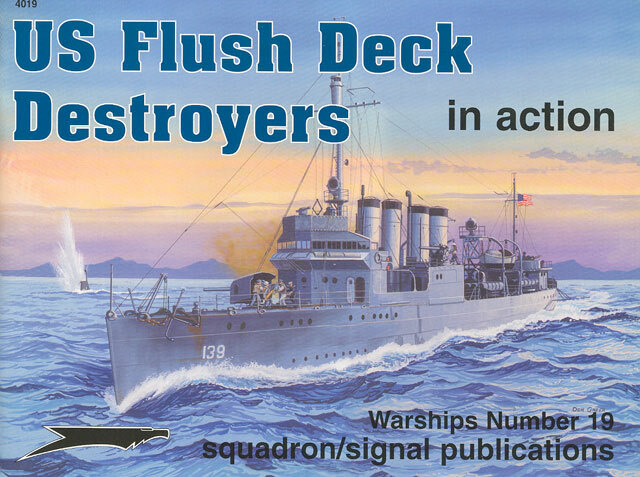 This Squadron/Signal "in action" book covers US Flush Deck Destroyers from the earlier classes through WWI, the 1920s and 1930s, WWII and their subsequent scrapping; although some lasted until the 1950s. To my mind, the greatest asset of this book is the excellent artwork in the form of line drawings of the ships, their equipment and, of course, an "in action" book would not be and "in action" book without the beautiful colour artwork of Don Greer. His piece on the front cover depicts USS Ward attacking a midget submarine at Pearl Harbour; with HMS Cambeltown in her final guise on the back cover. Six striking colour profiles in the centre of the book supplement these lovely pieces. My only criticism is the lack of mention of deck colours, as this is an important detail to ship modellers. Of lesser importance is the absence of a complete list if names, so a modeller might have been able to tell exactly which class their favourite subject was. This is an excellent, compact reference of this very interesting class of ship. Well done, Squadron/Signal.